Earlier this year, we started signing up Farley for Build & Grow workshops at Lowe’s. He was 3 when he started so I kept expectations pretty low. Basically, I figured I’d be building the stuff (or more accurately, I’d be cursing silently in my attempts and then I’d ask an employee for help finishing it). I gave it a shot because, what the heck, it was free. 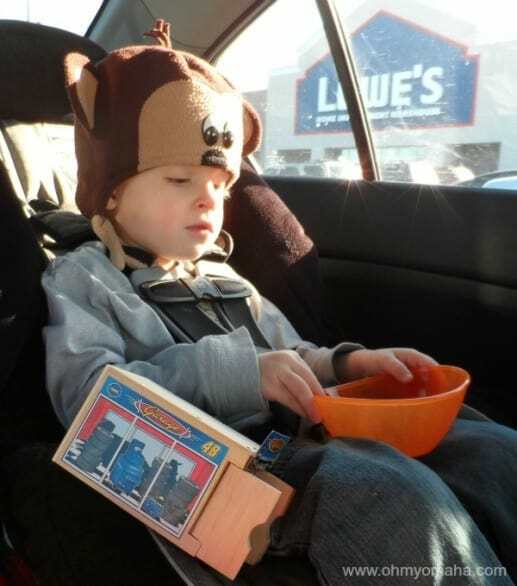 Wouldn’t you know, the projects for Lowe’s are easy enough a toddler can help. And easy enough that a woman who struggles with following diagram directions can do it. 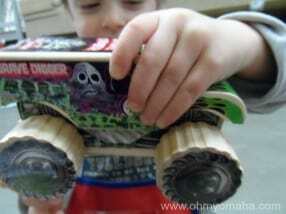 Farley’s favorite project was the monster truck. By far, the hit workshop was building a monster truck. According to a friend and mom of longtime Build & Grow fans, anything with wheels is popular, at least in Omaha (ie., show up early). What happens at these FREE workshops? I can give you the rundown of my midtown Omaha location, but I can’t imagine locations across the country go about things all that differently. Register online. Register far in advance to be sure you get in. (Of course, you can always show up and register, but that means waiting in the registration line and then waiting in the other – with antsy kids. No thanks.). You’ll need to print out an authorization/consent form with your kid’s name on it. Bring that with you to Lowe’s. 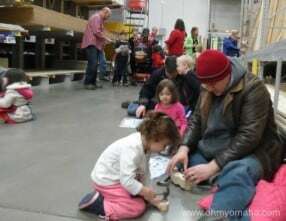 Lots of families hard at work at Lowe’s. You show up the morning of and get in line. A long one. Don’t worry, once the Build & Grow workshop/clinic starts, the line moves along quickly. At the first workshop, your child will be given an apron to keep and goggles. Not all kids will look as hip as mine wearing them. You hand the authorization form and if this is your first time, they’ll hand your child a nifty and extra huge Lowe’s apron and goggles to keep, as well as the kit. The kit will have the instructions and all tools you’ll need to complete the project. Older children will have no problem going through the steps. Younger ones, like Farley here, will need lots of guidance, and assistance. Toddler love the small hammer perfect for little hands. Watch your fingers if you hold the nail for them; kids get a taste of blood and will seek out your hands from then on out. They also love the stickers involved. That will spare your manicure. When you’re done, you return your tools and show off the finished project. In return, you child gets badge, which supposedly you’re supposed to sew on to the apron. I don’t sew, so these puppies are collecting in the little apron pocket. It’s all over in less than an hour, depending on Mom or Dad’s patience level and how crazy the instructions are to understand. Not a bad way to spend a Saturday morning, you guys can bond a little and your little rugrat can walk away with a free new toy. Score. One hour or less, your child has a new toy for you to step on. Win-win for everyone. This month, it looks like it’s all about “Monsters University” at Build & Grow, which is a cute theme. Sign up early, for sure. Wow. I had no idea. I’ve been (passively) looking for something to do with my first-born. thanks! Have you checked the “Monsters University” project later this month? The trunk looks like a cute project for a first-timer. My boys have done this several times. We did it once too when the grandparents were in town. It was a fun activity for Grandma and Grandpa to do with the kids. I thought the patches were iron-on. Whoops. I wasn’t going to mess with that, so I just got a big ol’ needle and sewed ’em on by just tacking them in three spots. Thankfully no sewing talent needed. Just strong fingers … and a strong drink. I was thinking of attaching them the way my mom used to do my Brownie badges: Super glue.